There are so many things to do in Kashmir but nothing more challenging than rafting in the white waters of the many rivers that cut through the Kashmir. The two most famous rivers where you can go for this extreme sport is River Indus and Zanskar river. River Lidder also has few stretches that are good enough to keep you enthralled. The rivers run trough few of the most mesmerizing landscapes, giving you the opportunity to explore those wonders of nature, which are other wise unreachable through land routes. Few stretches are long enough that they take days to complete. And in between, you will stay in camps setup under the snow-capped mountains and hilltop monasteries, just by the sides of these roaring rivers. Though there are rafting options in Kashmir region but they don't compare up to rafting in Ladakh region, especially in Zanskar. In other adventure sports, you get training sessions before you indulge in the real thing, but rafting is something where there can be no trial runs. All you get are few precaution tips and safety presentation. Here only the real thing prepares you for the real thrill. This is the place where you will be face to face with and the roaring and thrashing beast, the Zanskar river. The Zanskar is graded as a class IV, extremely rough river. But the first look of the river will be deceiving and the thought that the said difficulty of the river seems exaggerated will definitely cross your mind. The rafting trip will be few days long and the first two days might not feel that adventurous.But hold on, the real test begins after two days of rapids. The next few days you will be hitting fast rapids in the deep gorges and reveal it yourself why this rated so high. Apart from Zanskar River, Indus River also is a great option for thrilling white water rafting. 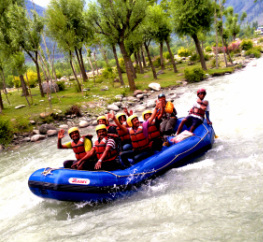 The best time for rafting in Kashmir is during summer time( May-September)when the rivers are full of water. In winters many rivers and lakes get frozen. Even in summers the water is freezing cold. Rafting is an extremely challenging sport so do not ignore the precautionary measures and warning signs that your tour guide tells you to look out for. Make sure that there are adequate rescue measures before you embark on this adventurous thrilling sport.